Toho Pictures had released a new Godzilla Resurgence trailer featuring more footage from the return of the king of the monsters. Check it out in the player along with two TV spots! A domestic release has not yet been confirmed, buy Godzilla Resurgence will hit theaters in Japan on July 29. Godzilla Resurgence (シン・ゴジラ Shin Gojira?) is an upcoming Japanese science fiction kaiju film featuring Godzilla, produced and distributed by Toho. It is the 31st film in the Godzilla franchise, the 29th Godzilla film produced by Toho, and Toho’s third reboot of the franchise. The film is co-directed by Hideaki Annoand Shinji Higuchi, with a screenplay by Anno and visual effects by Higuchi and stars Hiroki Hasegawa, Yutaka Takenouchi, and Satomi Ishihara and reimagines Godzilla’s origins where he emerges in modern Japan for the first time. 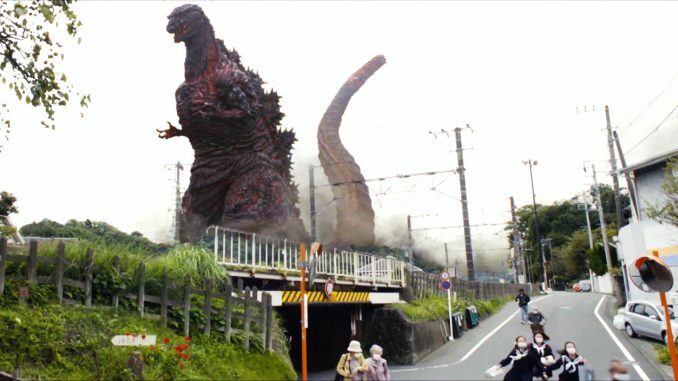 In December 2014, Toho announced plans for a new domestic Godzilla film. Anno and Higuchi were announced as the film’s directors in March 2015 and principal photography began on September and ended in October with the special effects work following in November that year. Godzilla Resurgence is scheduled to be released in Japan on July 29, 2016 in IMAX, 4DX, and MX4D.